Billings Bail Bonds Information: What You Must Know! Your Billings bail bonds company is Central Montana Bail Bonds. We provide affordable Billings bail coupled with the fastest release from the Yellowstone County Detention Center. Our bondsmen have put together information to help you maneuver your way through the Yellowstone County courts and inmate detention facility. We hope the information helps you make the best choice for bail, Central Montana Bail Bonds of Billings. Arrested in Billings Montana? The first thing to happen other than booking is going to be the transport to the Yellowstone County Detention facility. It’s here where your bond is posted to help effect your release. Our bondsmen are only minutes away and can write any bond, in any amount needed – just call to let them know your amount. We hope you find this information worthwhile and if there are any changes or items you wish to see added to the Billings bail bonds page, please send a message below using the contact form provided. 40 years ago, Billings bail bonds were founded on the belief that all persons are innocent until proven guilty, and that all people deserve the right to bail. Your Eighth Amendment rights are a cornerstone in our corporate beliefs. We strive to write your bond quickly and efficiently to effect an immediate release of your friend or family member. 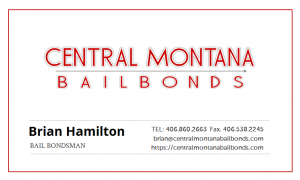 Central Montana Bail Bonds CMBB Billings Bail Bonds agents proudly serving the residents of Montana in need of cheap bail 24/7/365 fast!